I came pretty late to the DS platform and bought a DS Lite primarily because it was the last DS to be backward compatible with the Game Boy Advance. I had too many games from the Advance that I still wanted to be able to play on the newer system. I've been a longtime fan of Nintendo handhelds. They're well supported by game developers, often backward compatible and one of the few handheld options on the market. I've never liked their screens - it always seems hard to get the right lighting conditions to really see anything. But they are the primary handheld developer out there. The Nintendo DS Lite is a dual-screen handheld game console developed and manufactured by Nintendo. It is a slimmer, brighter, and more lightweight redesign of the Nintendo DS, designed to be aesthetically sleeker, while taking styling cues from the Game Boy Advance SP, and to appeal to broader commercial audiences. It was announced on January 26, 2006, more than a month before its initial release in Japan on March 2, 2006 due to overwhelming demand for the original model. It has been released in Australia, North America, Europe, New Zealand, Singapore, and defined regions in South America, the Middle East, and East Asia. As of September 30, 2009, shipments of the DS Lite have reached 84.49 million units worldwide, according to Nintendo. Capable of receiving Wi-Fi signals from other Nintendo DS Lite systems, the original Nintendo DS, Nintendo DSi systems, Nintendo Wii systems, and Wi-Fi access points. WEP encrypted and unencrypted networks are supported. WPA encryption is not supported. Size: 73.9 millimeters (2.9 inches) tall, 133 millimeters (5.2 inches) broad, 21.5 millimeters (0.85 inches) wide. Top Screen: A backlit, 3.12-inch, transmissive TFT color LCD with 256x192-pixel resolution and .24mm dot pitch, capable of displaying a total of 262,144 colors. 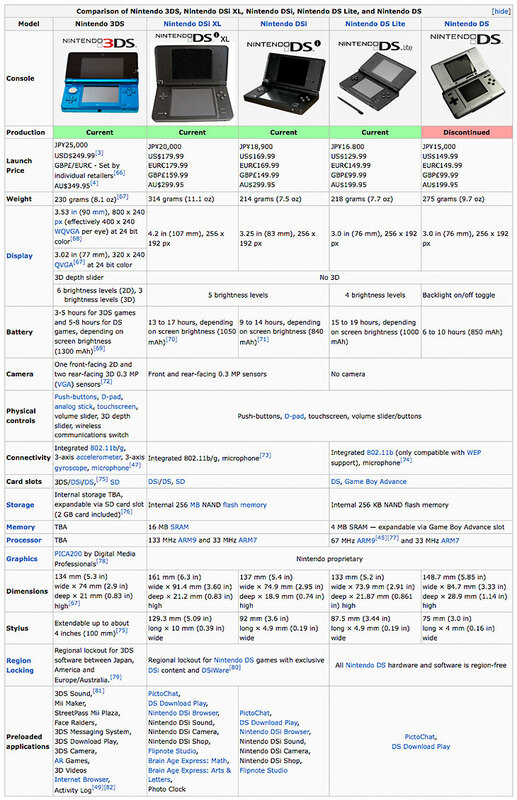 Wireless Communication: IEEE 802.11b; wireless range is 30 to 100 feet; multiple users can play certain multiplayer games with one DS game card using DS Download Play. Controls: Touch screen, embedded microphone for voice recognition, A/B/X/Y face buttons, directional control pad, L/R shoulder pads, Start and Select dimples, and Power slider. The stylus is 1 cm longer and 2 mm thicker than the stylus of the original Nintendo DS. Input/Output: Ports for both Nintendo DS game cards and Game Boy Advance game packs, terminals for stereo headphones and a microphone. A removable cover for the Game Boy Advance game pack slot provides added protection from dust and other foreign materials. Other Features: Embedded PictoChat software that allows up to 16 users within local range of one another to chat at once; embedded real-time clock; date, time and alarm; touch-screen calibration. The alarm can only be activated if the power is on. Battery: Lithium ion battery delivering from 15 to 19 hours of play on a three-hour charge; power-saving sleep mode; AC adapter. Repair parts: L-R switches: NKK type SKRTLA available from Mouser and others. A larger model of the DS Lite was an unreleased alternative to the DS Lite. It was ready for mass production but Nintendo decided against its release as sales of the DS Lite were still strong. 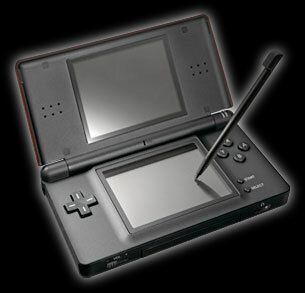 Instead Nintendo prepared the DSi and released an "XL" version of that console a year later. This larger DS Lite featured an increased screen size of 3.8 inches (9.7 cm) (slightly smaller than the DSi XL's 4.2-inch (11 cm) screens) and lacked the wide viewing angle of the DSi XL.